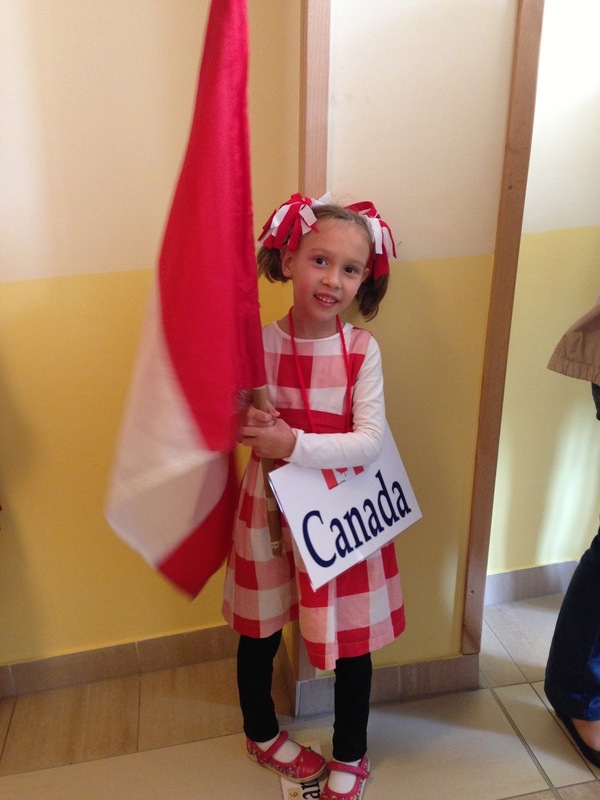 We're celebrating Canada Day this year at the grandparents' house. Since my kids are expats, they don't really know anything about the day, so I thought I'd drum up some enthusiasm by doing a Canada Day craft with my preschooler. I was inspired by this 4th of July wreath at No Time For Flashcards - my original plan had been to make a Canada Day version of it, but it ended up morphing into something quite different! You might want to try making both! These fireworks were super easy to make and could be easily modified by using different colours to suit any country's patriotic holidays (4th of July? ), Olympic spirit, or to support your favourite sports team! We layered the red and white strips in a stack, then used a strip of the red felt to tie around the middle. That's it. Now they're ready to be hot-glued to some hair clips or hair elastics, or perhaps a red hairband. Princess Pea is excited to wear them to go see the real fireworks this weekend! If this is your first visit to Mama Pea Pod, welcome! Please use the buttons and labels on the right and below to take a look around. And do pop over to our Mama Pea Pod facebook community, too, where you will find lots more kid-friendly ideas shared daily. The last edition of the Outdoor Play Party featured 31 fun ways to play outdoors! (Please forgive us if we haven't commented on every one of your posts, we are all extra busy having lots of outdoor fun with our own kiddos now that summer is here!) I really loved this Chalk Dress-Up Dolls post from The Iowa Farmer's Wife - my girls will LOVE doing this! 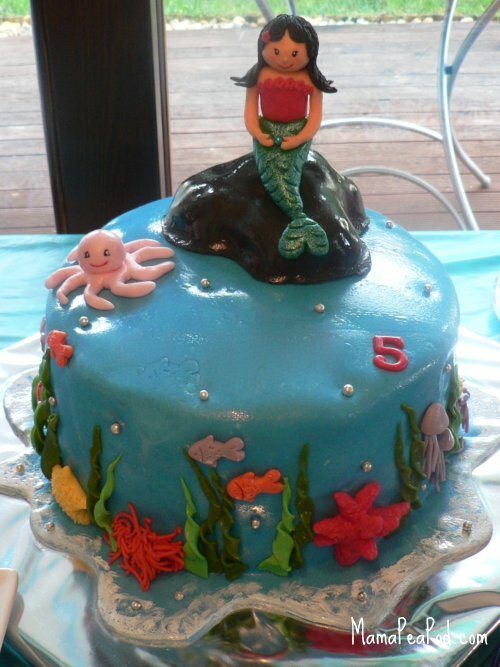 Princess Pea is turning 5 this month, and we had her mermaid-themed birthday party last weekend. It was so much fun! From the preparations, to the games, to the food, to the amazing cake my friend made for her, it was non-stop giggles and laughs for me, her, and all of her friends! I debated breaking this up into several posts, as it was such a great party and I have so much I want to share! But, since it would take me forever to prepare multiple posts, I'm just going to share the highlights here with you, and I'll divide this post into several sections instead. I already shared our homemade 3D mermaid party invitations. Here's what else we did to set the stage for the mermaid theme. We ordered mermaid-themed plates, cups, napkins, and placemats online, and for the boys, I picked up pirate-themed dinnerware. I got blue and turquoise tablecloths and cutlery from a party supply store and cut them to the size of their kiddie tables. This is my new favourite way to decorate for kids' parties! 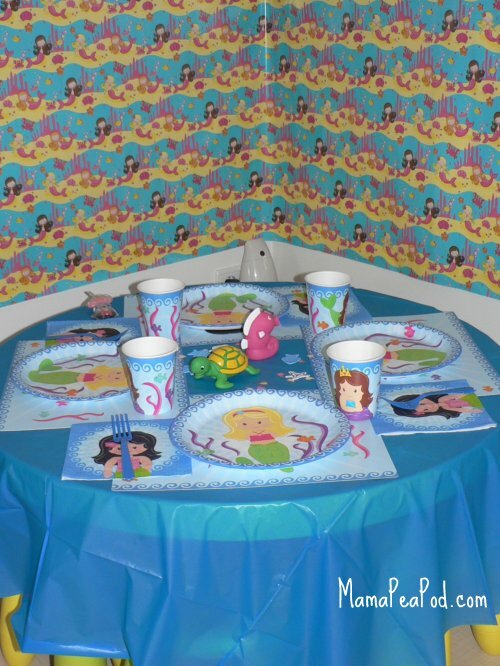 I picked up some mermaid-themed wrapping paper and put it up on the wall next to their tables with sticky tack. Simple, easy, and makes them feel like they're 'in' the theme. It also made a perfect backdrop for party pictures later on. A friend had given us some adorable sea-life wall stickers a while back, so we put them on the window temporarily, between the 'seaweed' streamers that were hanging down. And, of course, we hung blue, turquoise, and 'sea foam green' streamers from the lights and hung balloons in the same colours. Another way we 'set the stage' was with the food itself. What do mermaids eat? Oh, and sparkly mermaid cake, of course! This cake was made by my super-talented friend, Masha. Don't you just love the edible glitter on the mermaid's tail? Make that sparkly, rainbow mermaid cake! As the guests arrived, we turned them each into Little Mermaid Princesses. They each got some turquoise 'mermaid hair' to clip on; some sparkly, turquoise 'mermaid bangles'; a 'seaweed necklace' (a green, leafy lei from the dollar store); and some 'mermaid shimmer cream' to rub onto their arms and faces if they wished. Then they set to work decorating their own mermaid princess crowns. I had prepared the crowns by cutting out a rectangle of stiff, gold card, and cutting a wave design along one edge. I punched holes in each side, and tied on some elastic (about 25-30 cm long). I set up a 'crown station' in the corner of the living room. 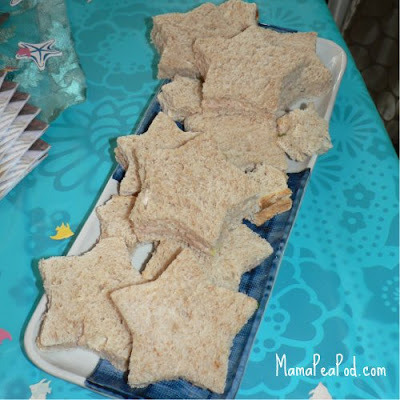 The girls had a selection of sequins, fake jewels, tiny bits of sparkly sticky-backed craft foam, stickers, and wooden fish and starfish shapes to stick on. They were a hit, and so cute on all the little mermaid princesses! We had SO much fun with our games and activities! I always figure the sign of a good kids' party is no tears - well, the kids spent the whole 3 hours laughing non-stop. So I guess that's the sign of a GREAT party! 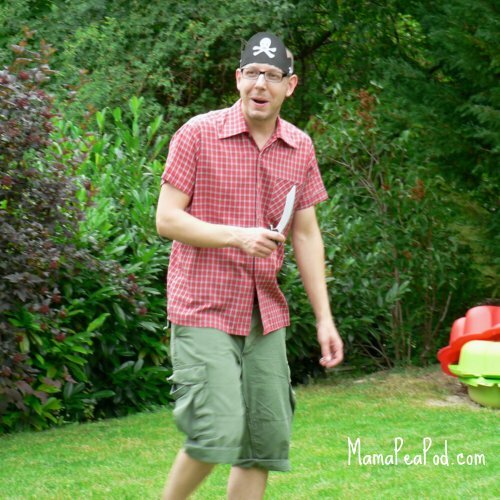 We played Mermaids and Pirates - Daddy made an excellent pirate (all kitted out with his foam pirate hat and cutlass! ), chasing the girls all over the garden. We set up 'safe zones' on each side of the garden using hula hoops, and the mermaids had to run across without getting caught by the pirate. If they got caught, they became pirates, too. They LOVED this game! It was so popular that later we played another variation of it: Fishing for Mermaids - this time Daddy had a 'fishing net' (a piece of pink netting with beads threaded into it that we just happened to have) that he chased them with. Next we had an Under the Sea Dance - to the tune of the same name from The Little Mermaid soundtrack, of course, I called out the names of sea creatures and they had to use their dramatic play skills to 'dance' like the creature. Much hilarity involved in this one! The Funny Face Contest was a lot of fun - and they especially enjoyed getting to see all their funny faces on the TV right afterwards, as we hooked the camera up to the HDMI. And finally, we had some Underwater Bubble Blowing - I set out a tub and filled it with bubble solution (I used the 1L refill bottle of Tesco brand bubbles as I find they make really good bubbles, and the ingredients to make homemade bubbles are hard to find and expensive here, but I also like the Super Miracles Bubbles brand, which we can't buy here). I set out a selection of bubble wands that I had picked up for a couple of dollars at Michael's last summer. 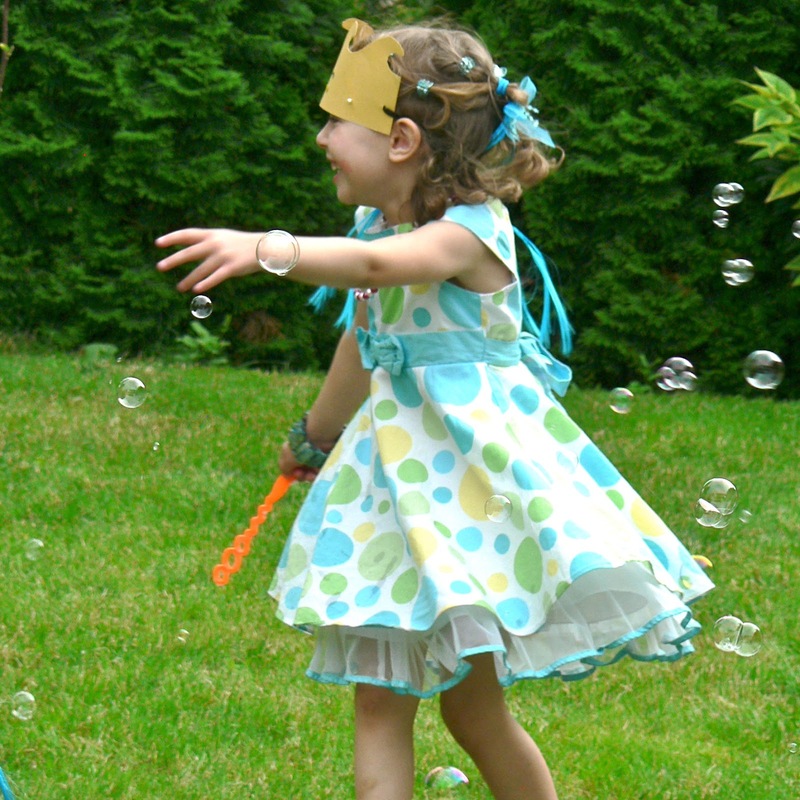 They enjoyed making bubbles of all sorts of shapes and sizes, and in no time the entire garden was filled with bubbles. 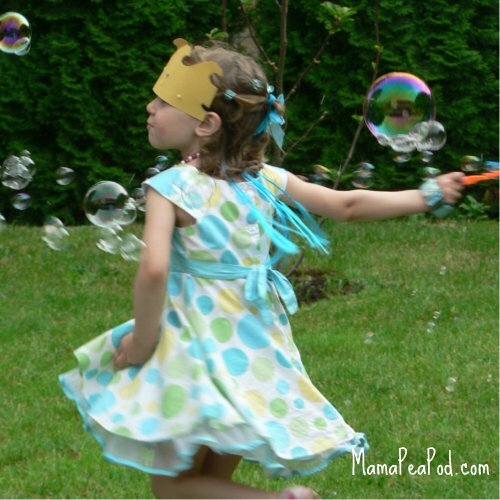 I must admit, I love a garden full of bubbles! All in all, I'd say it was one of our best parties ever, and probably the one that I enjoyed the most myself! If this is your first time visiting, welcome! Please take a look around using the buttons and labels on the right and below. I'd love for you to also come join our Mama Pea Pod Facebook community, where you'll find lots more party, play, and parenting posts shared from the best of the blogosphere. 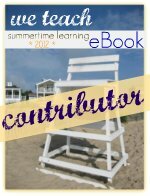 Have you downloaded your free copy of the We Teach Summer Learning e-Book yet? It's packed full of fun and educational summer activities for your little peas, including one from us. Check it out! And if you aren't already a member of We Teach, I highly recommend it as an excellent, free resource for teachers and parents, with interest groups to suit every need. Today is our first day of summer holidays!! Woohoo! Last year we got through most, but not all, of our summer bucket list. This year, I'm including a few of the things we missed last year (like making DIY fossils), a few that we do every summer (like eating lobster), and a whole bunch of new ideas we've been saving up. This year I've divided it into Rainy Day Activities, Sunny Day Activities, and Any Day Activities. I'm sure I'll be adding to it as inspiration strikes or as the kids make requests, so check back later in the summer for more ideas. I hope you'll find these ideas inspiring, and if you make your own summer bucket list, I'd love for you to share it! 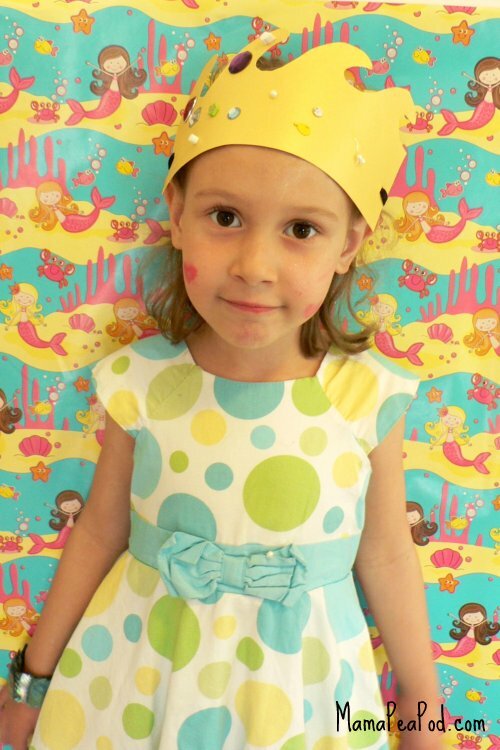 June is Mermaid Month at Mama Pea Pod! Why? 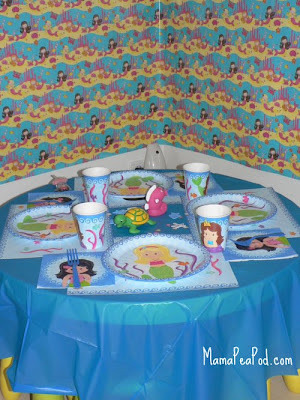 Because it's Princess Pea's birthday month, and this year her party theme is mermaids! That means that we are going mermaid crazy at the moment! If you didn't already see it, be sure to check out the Mermaid Waldorf Doll tutorial from this month's Time for Mama guest post by Taming the Goblin - and enter to win the doll in the tutorial. And for the kids' creative time, give them a go at making mermaid handprint paintings - we had so much fun doing ours! So, the first way to set the stage for a birthday party is, of course, the invitations. Here's how we made some beautiful, sparkly mermaid party invitations! These were inspired by the Usborne book "Mermaid Things to Make and Do" - as you may know if you've been following for a while, we love the 'Things to Make and Do' series from Usborne; we have several of them (no, this is not a sponsored post - we just really, really love them!). Now, because of the fiddly pieces, I ended up doing most of the 'labour' for these, while Princess Pea made the selections for which papers to use, which pieces to stick where, etc., and stuck on some of the less fiddly bits. She doesn't have a lot of patience for fiddly things, but an older child could do it independently. First, we got some good quality, blue card stock from the stationary shop, folded in half, and, using coins to draw around, made the cut-outs for the waves along the top. Then we used some skin-coloured-ish bits of scrapbooking paper to make the torsos, arms, and heads separately. Next, we used various scraps of scrapbooking papers and old stationary envelopes to cut out hair, clothes, accessories, and various sea creatures. Finally, we used some sparkly green craft foam to make the mermaid tails. Then we stuck each piece onto the card, making sure part of each mermaid went over the edge of the card, creating a 3-D effect. (You could make them even more 3D by using those foam stickies to attach them, instead of glue.) As a final touch, we drew faces on the mermaids and sea creatures with a pen. We just love how they turned out!